Colonel John Griffin Jr. is a good and honorable soldier, determined to protect Ellyn Sinclair at all costs – especially from himself. Once, he’d rejected a young Ellyn’s advances, because he could not give her the life she deserved. Instead, Grif stood up as best man when Ellyn married his best friend. Then, he became a member of the family, godfather to her children. But now Ellyn is a widow, back in Far Hills, Wyoming with her two young children, and having a tough time. And no matter what it costs him, Grif will do his duty – help Ellyn and her children, while ignoring that he has never stopped wanting her. 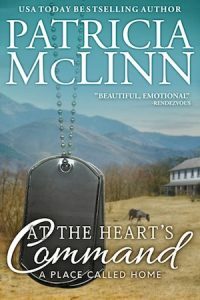 Revisit the characters you’ve come to love in At the Heart’s Command in another of Patricia McLinn's contemporary romance collections, The Wedding Series. John Griffin, Ellyn Sinclair and the Far Hills ranch have a cameo in The Forgotten Prince (Book 7), a moving, passionate story that brings some royal intrigue to Wyoming. Colonel John Griffin Junior looked up just in time to see the bear-like figure of Brigadier General William Pulaski slap a sheaf of papers on the desk of his Pentagon office. A rumbling bass would have fit Pulaski’s build. Instead nature had doled out a high, light voice. He made up for the lack of lower notes with volume. Plenty of volume. Grif could try to tell the general his reasons, but he hadn’t reached the rank of colonel by being suicidal. General Pulaski gave him a long look that Grif returned. The older man broke the stare, sighed, then dragged the visitor’s chair close, so the desk seemed as much his as Grif’s, and spoke in – for him – a softer voice. Grif’s hold tightened on the pen he’d been using to sign letters. He said nothing. “I’m not going to change my mind, sir.” Grif accepted that this might not be the right decision – certainly it wasn’t for his Army career, and it also might not be right for reasons that had nothing to do with the army – but he was sticking to it. The general abruptly rose and strode out, followed by a fading trail of profanities. Grif wondered idly how many degrees hotter those profanities would have turned if the general had known that instead of wine, women and song, there would be an eight-year-old boy, a ten-year-old girl and one woman. None of whom could ever be his. Ellyn Sinclair straightened the final pillowcase, took a clothespin out of her mouth, clipped it over fabric and line, then bent for the emptied basket. The Wyoming breeze would dry this laundry fast and for free. Up here behind Ridge House the breeze didn’t stir dust, which made the climb worthwhile. She scanned the sheets flapping peacefully. Even if her dryer fund wasn’t needed to fix the car, she wouldn’t have used a dryer on such a perfect day, an oasis of warmth in Wyoming’s unpredictable April. Although it would be nice to have the option. Of course it would be nice to have a number of other things, too. Ellyn raised her free hand and let the breeze float clean, crisp cloth against her palm. There was one worry she didn’t have – that she’d overcompensate for her children losing their father by spoiling them with material things. Although she would make it up to them. With the most secure, loving home she could fashion. Standing on her own two feet. Sometimes in the gray hours before dawn, she would admit she hadn’t totally banished worries about such matters as Meg and Ben bearing permanent emotional scars. But more often she reminded herself of one particularly pithy lecture from Kendra, who as both neighbor and friend, had pointed out the danger of self-fulfilling prophecies, expounded on the resilience of the human spirit in general and of Ellyn’s children in particular, and wrapped up by extolling the effective double-whammy of love and common sense. That prescription had certainly made these past six months much better than the previous six. Although… Had Ben been subdued? That question had popped into her mind after the kids went to bed last night and had intruded several times this morning at work, while laying out ads for The Far Hills Banner. She’d watch him more closely for that tonight. Ellyn pivoted to start down from the height that gave Ridge House its name. But she paused at the sight below of an unfamiliar sedan in the turnaround area beside the house. Now and then strangers left the highway thinking the ranch entrance was a county road. But they usually stopped at Kendra and Daniel’s place, rarely getting this deep into Far Hills land before realizing their mistake. Her heart lurched against her ribs, hard enough, it seemed, to leave a bruise. At least on the inside. He smiled and raised his hand. She started straight down the hillside, not bothering with the deteriorating path, and letting the slope hurry her steps. A scene from the library DVD of Gone With the Wind she and the kids watched recently sprang into her mind. The moment when Melanie spots a tattered, injured soldier returning from war – her soldier – and, half stumbling, runs to him. Laughing and crying, she runs to meet her man. The straight-backed figure before Ellyn was definitely a soldier – even in jeans and deep green knit shirt instead of a uniform, that was obvious in the way he held himself as he climbed toward her. But she wasn’t Melanie, and Grif wasn’t her man. Because you have never known how to make a man yours. Not even your husband. Before the familiar voice in her head echoed to silence Ellyn leaned back, slowing her descent, although her heart still stumbled. Halfway down, she stopped as Grif closed the gap to arm’s length. Words weren’t working. She reached out to hug him the way she had a thousand times in the years he’d been such an important part of their family, when she and Meg and Ben and Dale had been a family. Only at the last second did she remember that the laundry basket, empty except for a bag of clothespins, was still tucked on her hip. That must have been why their hug felt so awkward. Or maybe what intruded on their friendly embrace was the separation of the past fifteen months after years of almost daily contact. She stepped back. He gave her space, but his arms lingered around her. She gained a few more inches of height as she backed up the hill, and his arms dropped to his side. She didn’t look anywhere close to great. She wore a T-shirt that had shrunk, topped by one of Dale’s old flannel shirts, which was big enough for the tail to flap around thighs covered in leggings bearing proof of painting Meg’s room yellow. She had no makeup on and her hair was a curling mess, as usual. But she’d learned long ago not to dispute polite compliments – acknowledging them with a quick smile, then plowing ahead was her strategy. She nodded, as if any of this mattered. In the past fifteen months, she’d wondered many times why Grif had disappeared from their lives, and she’d wondered when she would see him again. She had never let herself think about what the reunion would be like. If she had, it would not have been anything like this. Where was their old, easy camaraderie? Could a year’s absence kill a friendship that had survived decades? She blinked. Her mind repeated the single word, trying to grasp what he meant. Before she could form a response, he was continuing. He’d frequently been assigned to places where no one could reach him and that he couldn’t talk about when he returned. Single-car accident, one fatality. That was the official description of Dale’s death. To Ellyn it remained a blur – from the moment Dale had driven away from the house that night, to the early-morning arrival of the state troopers at her door, and through the funeral – a surreal blur of alternating waves of pain and numbness. She forced herself to finish the thought. Before the problems between her and Dale. Before Grif disappeared from their lives. Before Dale moved them all back here to Wyoming. Before Dale died. There’d been a third option. “Under the circumstances,” her mother had said, she and Ellyn’s stepfather, although retired to Arizona, would “take you and the children into our home, until we can get you back on your feet. So you can meet a man who can take care of you and your children.” Even as low as Ellyn had been then, she’d had the strength to know refuse that option. She’d had a lifetime of her mother’s ways. She wasn’t about to accept that future for her children. Only a flicker of his eyes gave away how he took that, but it was enough. She broke off because maybe she had meant to reproach him. That would be quite unlike the old Ellyn, but not out of the question for the new Ellyn forming from the ashes of her old life. Grif shook his head, then said, “I’m sorry.” She didn’t know if he meant for his disappearing act or about Dale’s death. She could keep apologizing. She could ask what he was sorry for. Those were things the old Ellyn would do. She could demand to know why he’d disappeared. Or why he’d shown up now. She could throw him off her property…except she was renting it, and come to think of it, he was part-owner of Far Hills Ranch, so she couldn’t very well throw him off his property. Especially when she didn’t want him to go. Suddenly aware they were staring at each other – and chances were good his shrewd eyes saw more than she meant to reveal – she turned and shifted the basket. Her offhand manner might have been more successful if he hadn’t come alongside her and gripped the laundry basket, forcing her to stop and turn to him. His mouth tightened, as he gave it a firm pull. She released the basket, and resumed her route. He stopped to face her. She kept going. “It must be years and years.” She reached for the basket, and he handed it over. She opened the closet doors hiding the aged washer valiantly chugging through another load and the useless dryer. She was babbling. She knew it. He knew it. But she didn’t want to talk about any of the things he’d been taking aim at. She transferred three rolled towels from the top of the dryer to the bottom of the basket. Raising her head, she found him looking at her, his expression giving away nothing. When his lips parted she had no idea if he would pursue his topic or go along with hers. Memories as clear and sharp as broken glass showered over her. She couldn’t escape the slicing shards. A final whine and shudder signaled the end of the washer’s cycle, breaking the spell. “Eighteen,” she said shortly, flipping the lid open and devoting all her attention to pulling out the wet tangle of dark clothes. For an instant, his directness nearly triggered her into answering as openly as she would have a year ago. “Charles founded Far Hills Ranch in the 1800s,” he said as if answering a quiz. Of course he already knew Kendra and Daniel had married in January. Ellyn had told herself she wasn’t surprised – or disappointed – when Grif declined his invitation to the wedding, blaming the press of his work at the Pentagon. “What has Kendra got to do with that legend?” he demanded in his old Grif-the-protector voice. Oh, yes, Grif-the-protector was back in full force. As the oldest of the kids who had gathered each summer at Far Hills Ranch, he’d always taken on the burden of being the designated adult. As a quiet, skinny girl with a mop of wild hair who communicated better with horses than people, she’d benefited from his protection more than once. “You are living on the edge. If she finds out you didn’t go straight to the home ranch…” She shook her head, the consequences too dire to spell out. Why? The question roared in her head, but there was no risk that she’d voice it. “Colonel? You’ve made full colonel? That’s quite a jump in a short time.” She looked back at him, but could read nothing in his face. As she took out another of Dale’s old shirts that she wore around the house, she used her peripheral vision to watch Grif remove the clothespin, turn the pajamas upside down and pin one cuff. He recognized the new problem immediately. She caught the inside of her cheeks between her teeth. No longer tempted to grin, Ellyn jerked her gaze and thoughts from where they didn’t belong, grabbed a clothespin and moved in to help him. He released the loose pajama leg to her hold, then reached over her shoulder to help keep it in place. With his other hand still on the first pin and with the pajamas in front of her, she was surrounded. She drove the pin home with more power than finesse, and quickly ducked under his extended arm. As they both bent over the basket, she to retrieve the shirt she’d dropped there when she grabbed the clothespin, and he to pull out one of Meg’s sweatshirts, she glanced at him, found his eyes on her and looked away. A year and a half ago, and anytime in the eight years before that, she would have said that John Griffin Junior was her best friend. Now it struck her that in all the years she’d known him, stretching back to spending most childhood summers on this very ranch with him and the others, she’d heard him mention his mother maybe a dozen times, and his father half that. So exactly how well did she know him? Certainly not well enough to have avoided being blindsided by his absence these past fifteen months. “Use a dryer on such a beautiful day? That would be a homemaker’s sin,” she said airily. He must have caught her reflexive wince, because he reached a hand toward her that she evaded by stretching up to secure the corner of one of Ben’s shirts. “Just quoting Rose Neal Brindford.” And Dale, but Grif didn’t need to know that. She watched him bite back the word she could almost hear on his tongue. He turned away, and his big hand settled on the inside seam of the jeans hanging upside down. Even as kids, he’d always hated the way her mother criticized her. Hated it even worse if she criticized herself with her mother’s words. But that was a hard habit to escape. The caressing touch of his hand dropped lower along that seam – nearly to the point where the left leg met the right, to the point where – Oh, lord. She spun around, looking for something else, anything else to absorb her attention. Marti and Kendra were right. She’d been alone too long. Living out here without any male companionship. Letting her libido get so desperate it rioted at the sight of a strong hand sliding down the seam of her jeans, toward – No! This was not the time for her to try to talk to him about anything, not while images of a hand on a pair of jeans strobed through her brain and bloodstream. She needed something to keep him occupied while she got her mind on a different track…an entirely different track. She let out an audible whoosh of relief as she spotted exactly the distraction she needed. Saved by the school bus. And to get away from the unexpected dangers of hanging laundry. And if he didn’t realize after that little speech that she’d changed, he never would. But somehow she didn’t want to see his judgment of this new Ellyn right now. She started back to the house without looking at him. If the army had Ellyn Sinclair, it wouldn’t need drill sergeants to cut recruits down to size. Don’t make a bigger deal of this than it is. That put him in perspective, didn’t it? Grif grimaced as he followed Ellyn’s straight back down the eroded steps. Well, what had he expected? That she – they – would fall on him like a savior? Just because pulling out of their lives had been like pulling himself off life support didn’t mean it had affected them the same way. When the four Sinclairs left Washington fifteen months ago, he’d known they’d have support in Far Hills, led by his aunt, Marti Susland. Even when he’d heard about Dale’s death, he’d been certain Ellyn and the kids would be looked after. Still, he’d planned eventually to come to Far Hills to assure himself they were okay, maybe try to pick up some of the threads that had once tied them…when the time was right, when he was sure he was ready. The time had never been quite right, and he hadn’t been ready. Then phrases from Marti started to nag at him. Subtle at first, but not for long. Increasingly more pointed phrases about tough times for Ellyn and the kids – tough times emotionally and practically. She’d eventually written it flat out in an email: They needed help. So it no longer mattered if he was ready. When he’d seen Ellyn up on the ridge, before she’d noticed him, she’d looked like the sweet eighteen-year-old girl whose image he’d never quite gotten out of his mind, even as he’d become friends with the woman she’d become. Wind whipped her hair into a curly froth, the sun glinting on lighter strands woven among the rich brown. That big shirt alternately molded around her to hint at what lay below and swung free to show the T-shirt that did a lot more than hint. Seeing her like that, he’d found himself praying that Marti was wrong. That he could check on Ellyn and the kids, find out everything was fine, then get himself back to Washington and away from…temptation. But Marti Susland wasn’t wrong. As a reconnaissance mission, this was no challenge. The unused dryer, the washing machine so loud it could drown out a tank, the path that needed rebuilding, the evasiveness about insurance, the uncertainty tempering Ellyn’s warm smile, the shadows under her soft brown eyes and, worse, the shadows in them. He’d been the one responsible for turning those shadows into flashes of pain. Stupid. Why had he brought up his visit to Far Hills after his graduation from West Point? They’d never talked about that incident. Instead they’d gotten past all that a long time ago by ignoring it. Why had he stirred it up now? To remind himself of the decision he’d made then – the right decision. Or maybe to remind her. It cooled had the warmth in her face from when she’d first seen him. He needed that, because he couldn’t hold up against that warmth. He had to remember why he’d come. To help three people who needed his help. And nothing was going to stop him. Not the U.S. Army. Not the pair of kids he was getting ready to face. Not Ellyn Neal Sinclair. Not even himself.